Finding the best used car for you will take more time than you consider. When you find for the best vehicle, it seems to be highly tempting to get into the driver seat to ride the vehicle. For that, you will rush through the process of buying. Before you commit to purchase the second-hand vehicle, there is one more step to consider – and it is Pre-Purchase Inspection or PPI. The PPI is considered to be the vehicle inspection carried out by the auto technician or licensed mechanic who will undergo thorough inspection of your vehicle to determine the mechanical, safety and cosmetic condition. You need to understand why it is essential to undergo a car inspection before you plan to buy the vehicle. The pre-purchase inspection of the used vehicle is quite important before you consider purchasing from the seller. The PPI mechanic will identify any potential issues and pinpoint the repairs correctly. Other than that, they also inform you about the possible issues which you will face in future. You must make a great purchase by considering for best inspection services which are right for you. Being a buyer, you have the necessary right to consider for PPI. By undergoing inspection, you can able to ensure whether the damage of the vehicle parts can be repaired easily and your vehicle is highly safe to drive. The mechanic will offer detailed repair on vehicle history and its related faults. From that, you can come to a conclusion whether to purchase the used vehicle or not. If you are planning to buy a used vehicle, it is quite essential to know its value prior to investing your money in it. However, it is highly possible by considering professional inspection services. The experience inspectors will analyze your car fully and offer you the best suggestion regarding whether to buy the vehicle or not. The well-trained mechanic will charge only low fees for their inspection work however it will save you from plenty of dollars in terms of potential repairs. The used vehicle inspection is performed by the qualified mechanics and it includes everything related to the car health. The inspection incorporates the detailed analysis of different parts of a vehicle like a vehicle body, damage occurred by accident, paint, rust etc. Why Is It Necessary To Use Inspection Service? Buying a vehicle is a good thing however it is essential to know its value beforehand to stay safe. 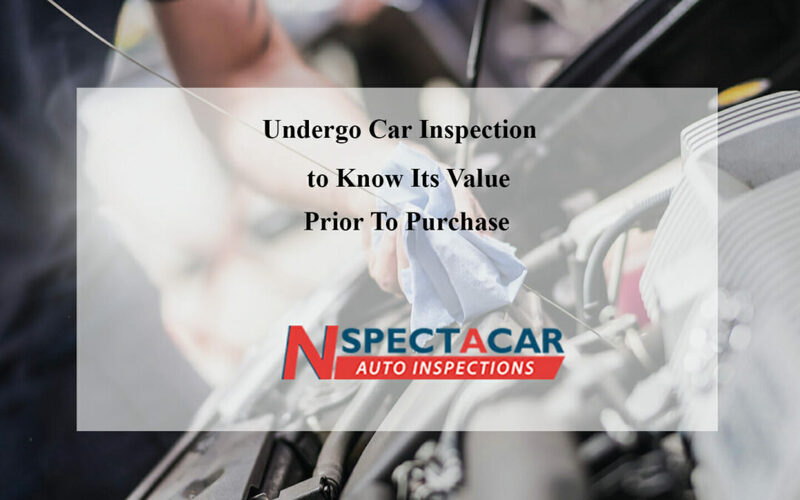 When times comes for purchasing the used vehicle, you must consider for best inspection service because you never understand what is hidden beneath the glittering outer appearance of the used vehicle which you want to purchase. Nspectacar aids you to obtain all relevant information about used car condition. The second-hand vehicle inspections performed by Nspectacar are done by expertise technicians at reasonable price rate. The proficient inspectors offer the exclusive car inspection services so that you can reap numerous benefits out of it. Always keep in mind that checking the used car parts will help you to know its price rate in today’s market.